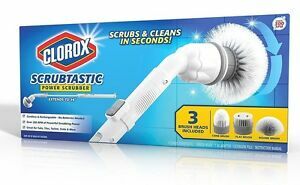 Details about Clorox Scrubtastic Rechargeable Cordless Spin Scrubber with 3 Heads - NEW! Clorox Scrubtastic Rechargeable Cordless Spin Scrubber with 3 Heads - NEW! There are 429 items available. Please enter a number less than or equal to 429. Immediate payment of C $38.99 is required. I tried the Scrubastic on my bathroom tile walls and was happily surprised by the results. It cleans grime with facility. It's very practical to clean bathroom.